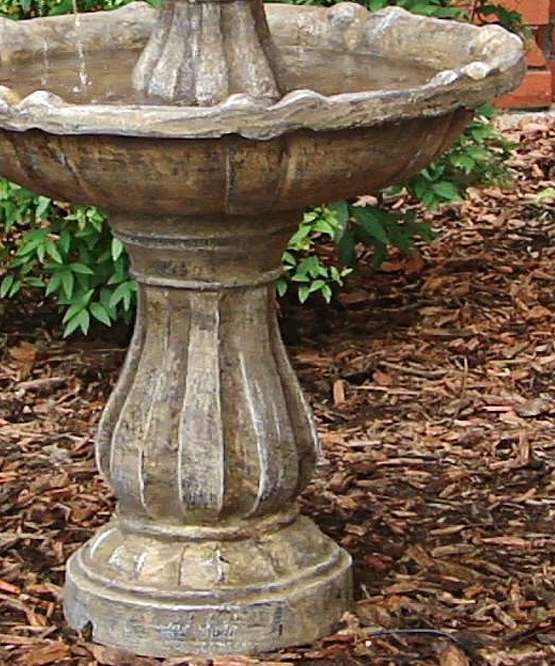 The Two-Tier Solar On Demand Fountain with Earth Tone Finish does double duty as a lovely fountain and functional birdbath. 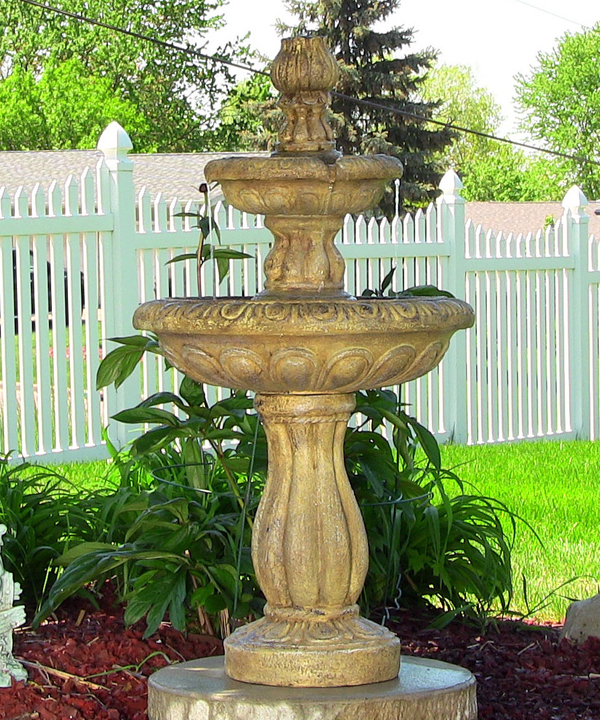 With a classic design, this is a lovely low-maintenance fountain that will easily enhance a wide variety of garden, patio, or balcony styles. Both tiers are wide enough for birds to spout and splash it and you get to enjoy the sights and sounds of soothing water along and your backyard birds. The solar (or optional electric powered) pump continuously pumps water from the basin through the top swirled spout, over a simple top tier and into a gently detailed basin. Lightweight and easy to assemble, move around your property, and store, this is a self-contained unit: no electric wires, no plumbing, no utility costs! This Solar-on-Demand fountain works off of a solar panel placed in direct sunlight. The panel does double duty: powering the fountain's pump and storing reserve energy in rechargeable batteries so that the fountain can work when you want it to for up two four hours at night or during cloudy weather. On the solar powered mode, the fountain runs directly from the solar panel, but the panel must be in bright sunshine. When the switch is turned on, the pump will work until it's store energy is used up, after which the fountain automatically changes back to solar powered mode. A fully charged battery will operate up to 4 hours after the sun goes down. You can operate it daily using the battery technology for consistent performance even in cloudy conditions, or leave your fountain off, charging the batteries for use when you want it, even at night. 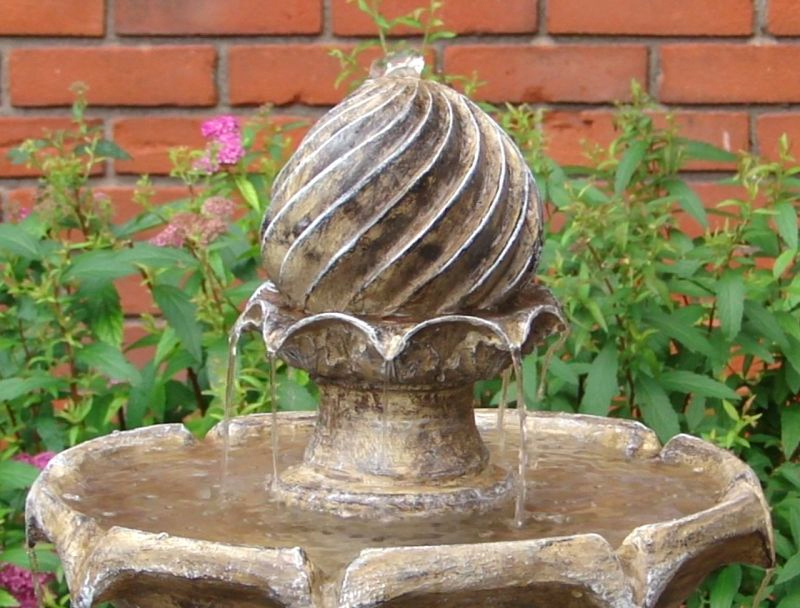 Because the solar panel can be placed up to 14 feet away from the fountain, this fountain can be placed in shady areas (included covered balconies, gazebos or even porches as long as the solar panel is in an area with plenty of direct sunshine. Note: while there is a substantial difference between the White and Darker Earth tone finish, each fountain will vary slightly the fountains have subtle hand-painted accents so no two will be exactly the same. * 4 AA rechargeable batteries come with the product and typically last 12 to 18 months, varying with how often the batteries run through a complete cycle (meaning the power is completely used up). To extend the battery life, we recommend letting the pump work off of the solar panel except times when you want to make sure it is working. Replacement are available in most hardware stores and home centers or can be purchased through us as special orders. Please note that when replacing batteries, you must purchase the same size and type of battery that came with the pump. Use of an incorrect battery type can destroy the solar controller system.